Control Practices for Canada Thistle, Botany & Plant Pathology, Purdue U.
Canada thistle is a cool season perennial which spreads by seed and vegetatively by creeping roots. In Indiana, Canada thistle normally initiates growth in spring, reaches the flower-bud stage the first week in June, and full flower about the third week of June. Seed production is usually completed in early July. Undisturbed plants tend to become inactive during hot weather (July and August). Then new shoots emerge during September and survive into November. The growth on Canada thistle in late September and October helps restore underground food reserves. The best time to treat Canada thistle with foliarly applied herbicides which move down through the plant is in early June after the first flower buds are formed and before the first flowers open and/or on fall regrowth during September and early October. Mowing, tillage, or herbicide application can alter the normal growth pattern and provide regrowth suitable for spraying. 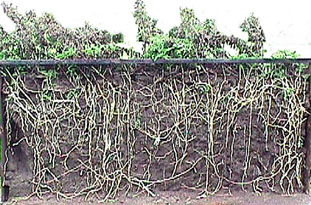 Creeping roots provide stored food and numerous underground buds to depths well below the plow layer. Removal of shoots and severe damage to established plants stimulate new growth from underground buds. It is the buds on the creeping roots of established Canada thistle plants which largely account for re-establishment after attempts at control. Buds on creeping roots can generate new shoots a year or more after top-growth has been destroyed. Seed is produced when patches with male flowers are in close proximity to patches with female flowers. While young seedlings are not competitive in most crops, they provide a source of re-establishment and take on perennial characteristics after about two months. Seeds can survive burial in the soil for 20 years or more. I. Shading-- Canada thistle is susceptible to shading. Thus, it grows most vigorously when no competing vegetation is present. Small grains compete less effectively against Canada thistle than most other agronomic crops grown in Indiana. Shade from a vigorous crop often provides much of the control needed to keep Canada thistle in check during the growing season. Conditions which favor rapid closure of crop canopies (good stands, adequate fertility and narrower row spacing) maximize the control provided from a competing crop and compliments other control practices (e.g. herbicides). II. Herbicides-- Herbicides for Canada thistle can be grouped as follows: 1) those applied to the foliage and which move down through the plant causing substantial injury to the creeping root systems, 2) those applied to the foliage and which move down through the plant causing partial (and variable) injury to the creeping root systems, 3) those applied to the foliage and which do not move down through the plant and can only result in shoot kill or inhibition (no injury to the creeping root systems can be expected), and 4) long residual herbicides which can be appropriate for permanent pastures, bare soil sites and other non-crop situations. A. FOLIARLY APPLIED HERBICIDES WHICH MOVE DOWN THROUGH THE PLANT AND CAUSE SUBSTANTIAL INJURY TO THE CREEPING ROOT SYSTEMS. One properly timed application may provide 50 to 90 percent control on shoot regrowth 6 months to a year later. At least one additional application made to regrowth 3 to 12 months later is needed to provide adequate stand reductions to provide long term control. Canada thistle can be treated after heavy frost and light freezes if the leaves appear not to be injured. B. FOLIARLY APPLIED HERBICIDES WHICH MOVE DOWN THROUGH THE PLANT AND CAUSE PARTIAL (AND VARIABLE) INJURY TO THE CREEPING ROOT SYSTEMS. These herbicides provide suppression of thistle shoot growth and may provide some long-term control if applied two or more times a year in conjunction with a competitive crop. Adequate soil moisture from the soil surface well into the subsoil. Green leaves, not wilted and generally free from extensive damage caused by insects, disease, drought, hard freeze, dormancy etc. The thistle has not been disturbed recently (within 2 months) by tillage. No mowing or cultivation should be done for 10 days after application. 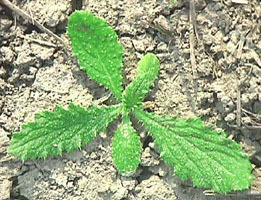 If one or more of the above situations is not met, control of Canada thistle will be reduced. Under extreme conditions, nearly complete lack of control can result. C. FOLIARLY APPLIED HERBICIDES WHICH DO NOT MOVE DOWN THROUGH THE PLANT AND THUS RESULT ONLY IN SHOOT KILL OR INHIBITION. No injury to the creeping root systems can be expected. These provide shoot kill and/or subsequent suppression in a competing crop but not much long-term effect when used alone. D. LONG RESIDUAL HERBICIDES which can be appropriate for bare soil sites (these should not be used on cropland). Glyphosate ROUNDUP ULTRA in conjunction with glyphosate tolerant (ROUNDUP READY) crops -- Soybeans are the easiest to use. Plant glyphosate resistant ROUNDUP READY soybeans. Then apply 1 qt/acre of glyphosate ROUNDUP ULTRA (or other labeled glyphosate herbicide product) over the top of soybeans and thistle when Canada thistle reaches six or more inches tall. Follow up as appropriate on thistles which recover. Between crop applications of glyphosate -- ROUNDUP (TOUCHDOWN) at 1 to 1 1/2 qt/acre applied in late may or early June after flower buds are formed and before flowers open and/or on fall regrowth in late September and early October. Glyphosate treatments followed by a crop which provides good shade and a selective herbicide to remove the shoots of thistle plants which escape can result in reductions of thistle approaching 50 to 90 percent a full year after treatment. Split applications of two 1 qt applications of glyphosate (3 to 12 months apart) should prove more effective than a single 2 qt application. Corn -- A clopyralid and flumetsulam combination sold as HORNET is less costly and next most effective to STINGER for selective control of Canada thistle in normal corn. Soybeans (at leaf drop) preharvest with glyphosate ROUNDUP 1 qt/acre. Grass sods for pasture, conservation reserve and ground cover -- Clopyralid STINGER at 2/3 pt/acre. High cost of chemical usually limits use of STINGER to spot treatments. One or more applications per season in established perennial grass cover should be applied in late May or early June as flower buds (8 to 12 inch stems) are formed and before flowers open. Canada thistle should be retreated when subsequent regrowth reaches 6 to 12 inches in height. A treatment on fall regrowth should be included. One or more treatments per season will be needed several consecutive years for complete control. Grass sods are less competitive with Canada thistle than corn or soybeans. Picloram TORDON is labeled for use in permanent pastures and non-crop and is generally selective on established perennial grasses. These herbicides are used to selectively remove or suppress the tops of Canada thistle in crops which will grow rapidly enough to provide a closed canopy and shade the ground before new thistle shoots recover (Soybeans in drilled plantings or corn in 30 inch rows). None of these herbicide treatments should provide adequate control of Canada thistle unless the shade from a competing crop is obtained. Thistle can be expected to re-grow and recover in the fall following crop maturation and harvest. CORN (tall varieties in 30 inch rows) -- Dicamba BANVEL/CLARITY/DISTINCT, 2,4-D (numerous trade names), primisulfuron BEACON, bentazon BASAGRAN, applied postemergence at doses suggested for selective control of broadleaf weeds in corn. Combinations of these herbicides [or mixtures of atrazine with one of these herbicides either as prepackaged mixtures (e.g. MARKSMAN, LADDOK) or as tank mixtures] can also be used. Clopyralid STINGER, dicamba BANVEL/CLARITY, 2,4-D, MCPA, or thifensulfuron + tribenuron EXPRESS HARMONY EXTRA after wheat is tillered and at doses and timings suggested on product labels. SOLID STAND SOYBEANS (top kill only) -- Postemergence herbicides applied at higher labeled doses include bentazon BASAGRAN, acifluorfen BLAZER or TACKLE, chlorimuron CLASSIC, lactofen COBRA, or combinations of two herbicides (e.g. bentazon + acifluorfen or bentazon + imazethapyr PURSUIT). Imazapic PLATEAU (for Conservation Reserve, and wild flower establishment and other non-cropland only uses), has provided longer term control than just top removal in our limited testing. Doses of imazapic PLATEAU (8 to 12 oz/acre) that control thistle tend to severely injure tall fescue. SELECTIVE CONTROL IN ESTABLISHED TREE CROPS -- Applications of glyphosate ROUNDUP 1 1/2 qt per acre directed underneath foliage and green bark of established trees and over Canada thistle 10 to 18 inches tall should be made in late spring or on fall regrowth. Canada thistle is at the correct height about June first (by June 20 thistle is 36 to 48 inches tall in full bloom) and in the fall (September and early October). Removal of low growing tree branches will make directed applications easier and less likely to injure trees. Roundup should not be applied to green or freshly injured stems. Two or more applications at 3 to 12 month intervals will be required to provide adequate control. Canada thistle blooms heavily in late June. An effective control program must include treatments for any plants growing in the spring. Clopyralid STINGER is labeled for selective control of Canada thistle in some conifers. Cost of treatment limits the use to spot treatment. NON-SELECTIVE SITE PREPARATION FOR PERENNIAL CROPS -- Two applications of glyphosate ROUNDUP/TOUCHDOWN 1 1/2 qt per acre at 3 to 12 month intervals (fall/spring, spring/fall, spring/spring, or fall/fall) made to Canada thistle plants 10 to 18 inches tall under good growing conditions should allow establishment of perennial crops (turf, pastures, Christmas trees, and nurseries) almost free from competing Canada thistle plants. This approach requires advanced planning and herbicide applications well ahead of crop establishment. An effective control program must include treatments for any plants growing in the spring, since Canada thistle blooms heavily in late June. Glyphosate ROUNDUP/TOUCHDOWN AT 1 TO 2 qt/acre TWO APPLICATIONS PER SEASON; one in June after flower buds are formed and before flowers open and a second on regrowth when it reaches 8 to 10 inches tall mid-season or 6 to 8 inches tall in September and early October. Applications of 1 to 1 1/2 qt/acre applied twice (initially and then on regrowth) will be more effective than a 2 to 3 qt/acre single dose. LONG SOIL-RESIDUAL NON-SELECTIVE CONTROL WHERE NO VEGETATION IS DESIRED. Before any of the following herbicides are applied, both the site and herbicide chosen should be evaluated for potential harmful environmental consequences such as soil erosion, damage to nearby off-target vegetation and contamination of ground water. Chlorsulfuron TELAR, picloram TORDON, prometon + sodium-chlorate + sodium-metaborate PRAMITOL P, and imazapyr ARSENAL.